At this point in 2018, we've all heard of the blockchain. We've seen companies hopping on what some are calling a trend, from Long Island Iced Tea Corp changing its name to Long Blockchain Corp and even Kodak adopting blockchain technology. But the question on most of our minds (besides, how we can retire by following this same trend in blockchain—or why exactly I'm talking about blockchain at this point in the year) is, "What exactly is blockchain?" This question becomes harder to answer, especially when you toss cryptocurrencies into the mix, and with the poor news coverage (where they equate blockchain with bitcoin). Granted, bitcoin operates on blockchain technology, but the bitcoin itself is not blockchain technology. The basic premise of blockchain. Blockchain technology, simply put, is a decentralized and distributed ledger of transactions across a peer-to-peer network that is cryptographically secure. Now, wait...this definition was supposed to be simple, but what the heck does "decentralized" and "distributed" mean, especially in relation to a ledger of transactions? And what is a "peer-to-peer network?" "Cryptographically secure?" Well, to explain this a little bit easier, we'll fall back on the popular example of trading apples. So, to set the scene, imagine you are in the park with a friend (in this case, me). I have three apples, and you have none. We sit down, and I decide to give you one of my apples. This is great! You have one apple now, and I have two. Now, you have the option to either eat your apple or to create another transaction involving the apple (you could even give it back to me if you wanted). This transaction is clear, it's easy to verify that it happened, that the apple I gave you is yours, and nobody else has that same apple. Easy: transaction completed and verified. It might not be you and I, but you get the idea. Take a moment and look at what physically happens to facilitate the transaction above. I physically took the apple and put it in your hand. You touched it and verified that it was, in fact, the apple you received. There was no need for a third party to verify the transaction, you didn't need to call anybody to come sit with us and confirm the transaction was taking place. I had three apples, I gave you one, and now I have two apples. So, why are we discussing exchanging apples, and how does this apply to blockchain? How do you really know that the "digital apple" that used to be mine is now yours? Answering this question is tricky and leads to a few more questions: How do you know I didn't make copies of the "digital apple" before I gave it to you? How do you know that I didn't give the apple (or any of its hypothetical copies) to somebody else, before you? 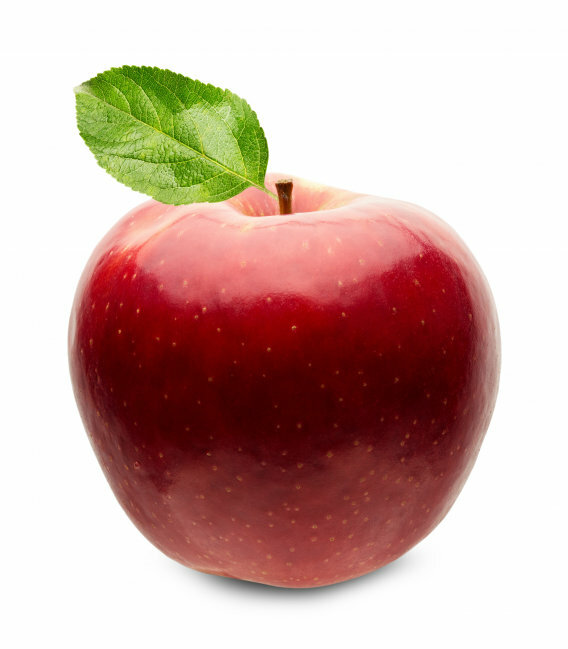 Does that "digital apple" actually exist or represent anything in the first place? Digital exchanges can definitely be problematic, as shown above. It isn't nearly as clear-cut, or at all the same as the physical transaction we demonstrated earlier. There's a name for this problem, called the double-spending problem. The question then becomes how do we solve the complexity of the problem of digital exchanges? I encourage you to think about these questions before you continue reading. What solutions for this problem can you come up with? How would you solve this? The obvious answer is to create some sort of tracking system, a ledger of sorts to record the aspects of the transaction. Things you could record include the parties involved, the type of the transaction, the currency involved, and many more. This solves the problem, right? We now have a way to track each transaction, and we can make sure that I only exchange apples that I have. Well, we're closer, but there still lies the issue of verification and trust. So, now we have to ask ourselves, "We have this ledger, but who is its keeper? Who verifies the accuracy and legitimacy of the ledger of transactions?" This is a question we've already answered in the form of third parties. When you shop on Amazon, they keep a record of that transaction and all of its parts. This is the reason you can review your orders, return products that don't work, and the reason why Amazon gets paid for the product, and the product gets sent to you. So does that mean that blockchain is unnecessary or solving a problem that isn't even there? Now, since you're reading this paragraph, I'm sure you know the obvious answer is no. There are some pretty large issues with the approach above. First, you have to ask if you can trust, with 100% certainty, the third party in control of the ledger. You then need to ask yourself if you can trust, again with 100% certainty, that the ledger has never been touched by anybody else, and could not have been tampered with in any way. And finally, you need to be certain that there is no way for anybody to add or remove currency (in our example, more "digital apples") from the ledger. Just adding the third party created another level of complexity that generates even more questions and concerns for us to address. How do we take these digital transactions and make them as simple as a physical transaction? How do we eliminate that new level of complexity and take it back to just you and me, exchanging apples? By this point, I'm sure you know what's coming next. The solution to this problem ends up being complex, and a little intimidating at first, but it is really ingenious. The solution to this problem is the blockchain technology. So, the way blockchain addresses this problem seems relatively simple at first: give everybody involved a copy of the ledger, and when a change is made and verified, automatically update the ledgers of everyone involved. Instead of the ledger being kept in one place, on one server, in one database (or one cluster), it lives on everybody's computer. All of the transactions that have happened are recorded, and everyone gets a copy. Now, since everyone has a record of each and every transaction that has happened in this chain, it's nearly impossible for someone to cheat, manipulate, or alter the ledger. If one person changes their ledger, it then needs to be verified by every other copy of the ledger. If the edit cannot be verified, every block after that edit is discredited, making it almost impossible to successfully cheat. It ends up being a really tough system to crack, and thus, is a very popular topic in the financial sector currently. On top of those ideas, there is also a benefit of being able to verify the ledger. Everyone involved, once a transaction is verified and added to the chain, receives a reward of more currency (digital apples) for completing the task. This is the same idea that is employed by Bitcoin for verifying blocks that are mined. Mining and Bitcoin are topics for another post at another time—so let's not tread too far into that territory. Let's look back at our simple definition of blockchain quickly: a decentralized and distributed ledger of transactions across a peer-to-peer network that is cryptographically secure. The idea of everyone having a ledger, and no one body being the "overseer" of said ledger covers the concepts of "decentralized" and "distributed." The idea that we're making transactions between 2 parties, without the middleman, covers the idea of a "peer-to-peer network," but what about blockchain is "cryptographically secure," and what the heck does that even mean? For something to be cryptographically secure, means that entries being added to the blockchain are encrypted using cryptography in such a way that each identifying piece of information is unique, and it is nearly impossible to predict what the next value(s) will be. With blockchain, understanding how this works is a little bit complicated—here's a brief example. Each block in the chain has several pieces of data. This data is encrypted so that specific identifying information cannot be read (such as the names of the people involved in a transaction), but that there is an identifying piece of information that shows the transaction did happen. The way this process happens in with something called a "hash" to identify the block. Each block stores transaction data, the current blocks hash, and the hash of the block directly previous to this block. 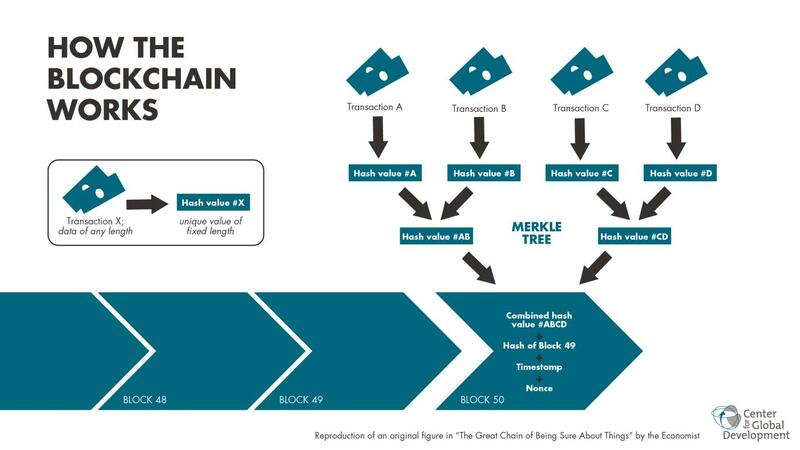 By maintaining the hash of the previous block, we now see the structure of a block-chain forming, as each block is connected to the block before it and after it. With this type of cryptographically secure data, the possibilities for cheating or modifying the blockchain in a way that wasn't intended seems nearly impossible. Check out the video below for a visual example of this technology. Now that we have a general understanding of blockchain and the technology behind it, we can ask ourselves what this means for the future of, well, everything. From finance to crime to education and government, just about anything where there is some sort of transaction of value blockchain can be applied. Imagine a world where the money in your savings account—that the bank borrows to make more money—could be tracked on a per-transaction basis in order to see exactly how your money is being used. On the flipside of that, blockchain could also facilitate easier and more managed distribution of social welfare services efficiently, and with a record of every portion of that transaction. Blockchain even helps to mitigate the risks regarding cybersecurity because it offers identity authentication through the always visible and verified ledger. Blockchain technology, as we currently understand and implement it, is fascinating and could revolutionize the way we do just about anything. The protections and services it facilitates lends it to being a technology that can be useful for almost any industry, business, or individual, and could provide some much-needed transparency to our usually cryptic and hard-to-navigate digital age of data gathering. Furthermore, it is also a system that, when implemented successfully, can save companies a ton of money (some estimate that blockchain could save lenders up to $20 billion annually in settlements). Leveraging the blockchain technology is something we're probably going to see more and more of in the coming years, and it is something with which we should all at least be familiar. The implications behind this technology and what it offers could fix many problems in just about everything, but as always, it's important to think about the security needed to maintain it at scale and the problems it could lead to. If you're interested in the blockchain and/or cryptocurrencies, reach out to us below and let us know why, and if you'd like to learn more!